Handmade artisan and vintage shopping at it's finest! 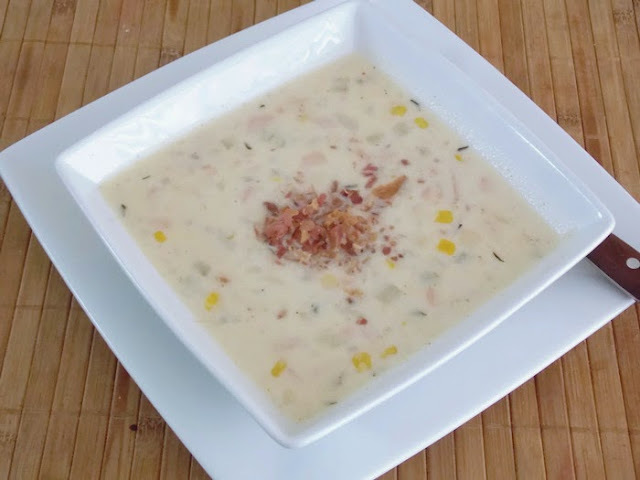 If you are a chowder or soup lover like I am, then you will definitely enjoy this recipe. - Cook bacon pieces in a large skillet over medium heat until the fat has rendered and the bacon is crispy. Remove and set aside. - In a stockpot add onions, carrots, celery, green and red bell pepper, garlic, corn and potatoes. - Sprinkle thyme, cayenne pepper powder, flour, salt and pepper. Add chicken stock and boil until tender. - Stir the soup well to crush some of the potatoes. Add half and half, and some bacon. Garnish with reserved cooked bacon and serve with green salad and bread. Recipe from Lily of Shop at Lily's on Etsy. Be sure and check out her beautiful celebration and baby items in her Etsy shop. Join our blog and watch for more delicious recipes! 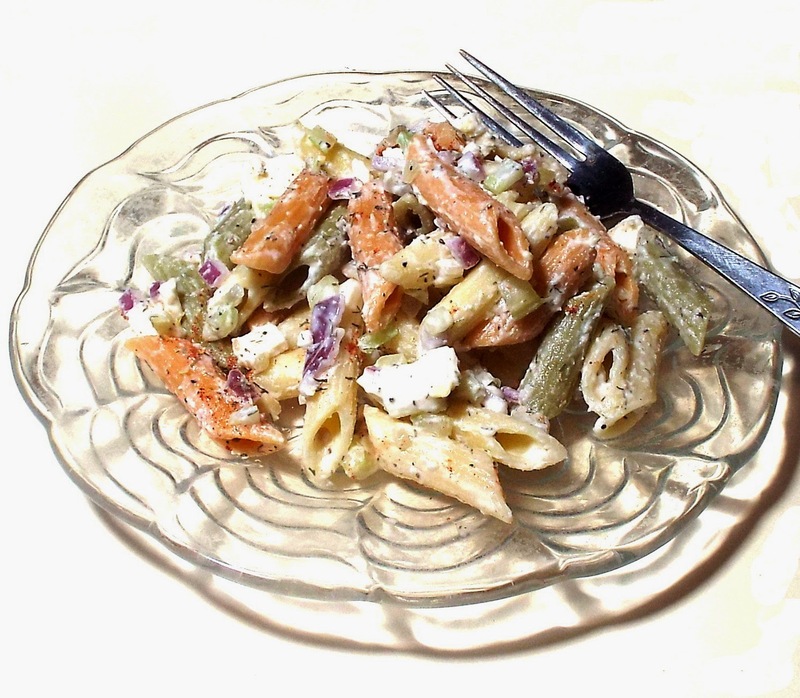 I made this for dinner tonight - pretty easy, and yummy, too! Doesn't that look like burger? Same texture, and you can beef it up with beef flavoring if you're not a vegetarian. For the bechemel, mix flour with a little bit of milk, then whisk in rest of milk. Microwave in 30 second intervals until it boils, then let it go a bit longer. Watch as it will boil over. Add a bit of sriracha sauce, it's just a bit bland. Might be good with a few chopped red or green peppers, too. Maybe more cheese. See ByTheWay's shop on Etsy, and stay tuned for more delicious recipes in the ETTEAM COOKS series. A beautiful bronzy brown and yellow treasury collection by Polly of OpenSuitcase on Etsy. Click on the photos to view all the details. Here's an easy flavorful recipe perfect for summer pot-lucks, picnics and bar-b-ques. Cook the pasta al dente, drain, rinse in cool water, drain. In a large bowl mix pasta and all the ingredients well. Refrigerate. This goes quickly at our house. Enjoy! See Midnightcoiler's shop on Etsy, and stay tuned for more delicious recipes in the ETTEAM COOKS series. Click on these items to see all the details and visit the shops. I'd like to welcome some of the newest members of ETTeam. We take on quite a hefty commitment of time when join any Etsy team. Team Membership is the best example I can think of to explain what 'paying it forward' is all about. On a team, we do not promote ourselves when we curate a Treasury. We unselfishly promote other Etsy team shops. Here are some of the shop owners who have made their commitment to the Etsy Treasury Team and we hope they will all have many successful sales to celebrate as members of this hard working team. In honor of the hole in one Jack Nicklaus ("The Golden Bear") hit at The Masters yesterday! ! Congratulations to Creative Spirit Glass... an excellent theme and a lovely tribute to well known pro golfer and Sportscaster, Jack Nicklaus. Click here to see the fabulous treasury shopping guides curated by Etteam (Etsy Treasury Team) members! The Etsy Treasury Team is a great group of artists, artisans and craftspeople who sell handmade goods, vintage finds and supplies on Etsy.com. Our blog will feature info on our shops and sellers, share some fabulous tutorials on the ins and outs of selling on Etsy, and sponsor some great giveaways. We are also great at making Etsy Treasuries, supporting each other, and contributing to the overall good of the Etsy community! If you are interested in knowing more about the ETTEAM, you can check out these pages. ETTEAM Favorites- See the items offered by Etteam members, and search for what you're looking for! Facebook & Pinterest pages of ETTEAM members - Become a Fan!! The ETTEAM Member Blogs and Websites! !